APA's work developing the comprehensive plan standards grew out of the larger Sustaining Places initiative. In May 2016, APA launched the Comprehensive Plan Standards for Sustaining Places Recognition Program Pilot. Communities that have integrated sustainability into comprehensive plans adopted or amended within the last five years submitted their plans for recognition. In October 2016, during National Community Planning Month, APA recognized eight comprehensive plans as examples of excellence in comprehensive planning through the first phase of the Comprehensive Plan Standards Recognition Program Pilot. APA completed a second phase of the pilot program in the spring of 2017 and recognized five additional plans as examples of excellence in comprehensive planning. Two trained reviewers experienced in comprehensive planning and/or sustainability rating systems reviewed and scored each plan against the comprehensive plan standards. Comprehensive plans recognized at any level will be acknowledged within their communities, at chapter conferences, and at APA's National Planning Conference. 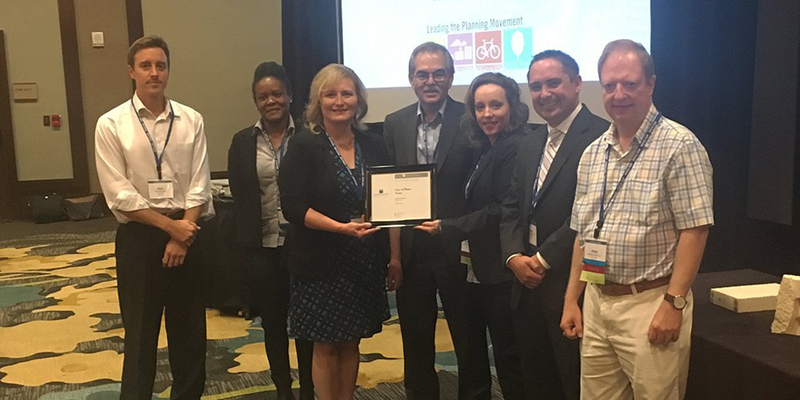 APA Research Director David Rouse, FAICP, presents Silver Level recognition to the City of Plano at the APA Texas Chapter Conference in 2016.